Posted on Saturday, 14 December 2013 15:34 . When I heard that I had a direct box to review, I must admit that I was a bit concerned about filling an entire review with something that usually has four jacks and a transformer in a box. Luckily for me and you, the acoustic guitarist, the LR Baggs Venue DI is so much more. It actually combines three units in one: a super low-noise, transformer-isolated DI; an equalizer with notch filter for dealing with feedback issues; and a chromatic tuner. And it does it all in a very smart-looking, pedalboard-friendly package. 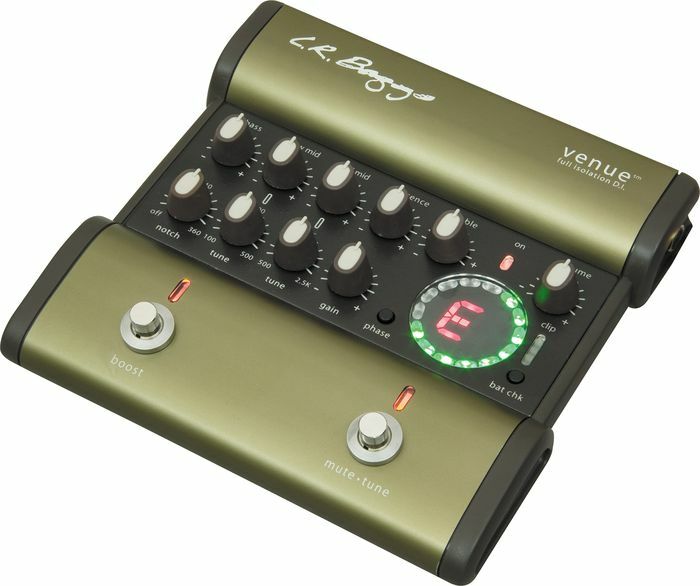 Packaged in a sturdy, futuristic-looking, two-tone brown case, Venue’s controls are laid out in a recessed area, which protects the knobs from happy feet. It houses an EQ section comprised of Bass, Low Midrange, Hi Midrange, Presence, and Treble. Bass, Presence, and Treble are fixed EQs that offer 12dB of boost/cut at 90Hz, 3kHz, and 10kHz respectively. Worthy of special mention is LR Baggs’ proprietary Garrett Null anti-feedback notch filter. In essence, it’s a sweepable filter between 60Hz and 320kHz, which is the primary range where feedback occurs in amplified acoustic guitars. For a little extra help in the feedback department, the Venue also has a phase reversal switch. I’d recommend flipping this one at every gig (phase can change from venue to venue) until you find the position that sounds best and is least likely to feed back. Venue’s Gain control is accompanied by an LED clip meter that allows you to set the appropriate level for your instrument. And as long as we’re on the topic of LED meters, there’s also a battery check that warns you when you have about four hours of battery life left. This readout will help you avoid any nasty surprises during a show. While the Venue does allow for use with an AC adapter, it doesn’t come with an AC power supply. Rather than stick you with a proprietary power supply and the problems of replacement, the Venue has a standard 2mm plug and will operate on AC power supplies rated between 7.5-14VDC with any amperage of 100ma and over. Next we come to the Master Volume control. Even this control shows a great deal of forethought, as does every other feature’s circuit design. The volume control adjusts the level of the 1/4" output only. The transformer-coupled DI is not affected and remains at line level. This allows you to raise your onstage or monitoring volume without affecting the level of the DI signal so there’s no need to tweak your front-of-house mix or recorded signal. Finishing up the controls, there are two footswitches. One is a Boost switch with a rear-panel level control that gives you up to 9dB of extra mix penetration. The other is a Mute/Tune switch that either mutes the DI or activates the onboard tuner. To engage the tuner, just press the Mute/Tuner switch, which simultaneously mutes all outputs and activates the tuner. If you’re not tuning or playing, the tuner automatically shuts down after one minute to save power. The face of the tuner, in keeping with the modern design of the Venue, is reminiscent of the LED readouts surrounding rotary controls on high-end digital mixers and control surfaces. Getting signal in and out of the box is accomplished via 1/4" I/O and a balanced XLR output for plugging into stage boxes and/or long cable runs. That signal then passes through an isolated transformer for noise-free operation and protection from the perils of the phantom menace (phantom power from the console). The Venue also has an effects loop with 1/4" send and return that enables you to patch your effects pedals while taking advantage of the Venue’s transformer-isolated noise and hum protection. Speaking of which, along with transformer coupling to provide electronic isolation through the DI output, there’s also a ground-lift switch to eliminate ground loops when connecting more than one unit to the DI. By way of real-world testing, I ran the Venue into a Soundcraft LX7II out to Mackie SRM450 powered monitors (a fairly ubiquitous setup). And just as I would do in any live setting, I dealt with feedback first. I turned up the level of the guitar just to the point of feedback and used the anti-feedback filter to "ring out" the guitar. All you have to do is turn the knob until the offending frequency is found and the notch filter takes care of the rest. In fact, the bandwidth of the notch is so tight that I found the filter to be not just transparent, in terms of its tonal impact on the guitar, but virtually invisible. I’m not sure how LR Baggs pulled this one off, but it pretty much eliminates any tradeoff between a full-sounding guitar and performance-killing feedback. You can disable the notch filter by dialing it counter-clockwise until it clicks off. As a nod to the tonally meticulous, the off-position takes it out of the signal path entirely for a purer signal. I also found the EQ to be quite musically useful with crossover points geared to the response of an acoustic guitar (as you would expect). Being able to cut bass at 90Hz helped with feedback elimination and allowed the guitar to sit better in a full mix. And the 10kHz treble was just right for adding "air" and sheen to the guitar. In use, I found the sound transparent and crystal-clear, but appreciated the ability to tweak where needed or add color as desired. Overall, the Venue really stepped up the quality of my live sound. In fact, you’d be hard-pressed to find an acoustic guitar preamp in its league. Thanks to its ultra-quiet performance, I also used it for direct recording and found that it makes for a great re-amping device too. A quality DI is an essential piece of gear for any acoustic guitarist, especially when you’re playing sound-system roulette from gig to gig. But the Venue is so much more than that. If you want to get your sound under your control in any venue, putting a Venue in your gig bag should be your first order of business. I've had the Venue since it first came out. Originally, I had problems with getting enough gain (even with powered preamps onboard my guitars.) The tuner was also problematic as a direct result of the gain issue. I contacted LR Baggs and for reasonable fee, they replaced the entire guts of the unit, installing into the chasis I already had. It works well now though sometimes I wish I had more gain available for use with passive pickups. All in all though, this is a one-stop shopping solution for a multitude of problems and is very flexible when showing up to a gig with a bad soundman. I love also that you can adjust the volume of your monitor via the outbound 1/4" with out effecting the line level XLR. This is not at all unique to this unit but I always love it. The boost switch is useful at solo time though I usually perform alone and don't use it. Regarding the tuner, it is big bright and sensitive which helps a lot because I play many different tunings. I recommend the Venue. Mindy, I have used this unit with standup bass, an eminence compact standup and a Kala U-bass, all with no problem. Have not tried with an active system but you'd just have to adjust the input volume. I know the LR Baggs Venue DI is used with an acoustic guitar but can you respectfully use it with an electric bass and have it still sound great and not blow it up?